Foreign exchange rates are among the most important economic indices in the international monetary markets. Applying forecasting models for forecasting in exchange rate markets and assisting investment decision making has become more indispensable in business practices than ever before. For large multinational firms, which conduct substantial currency transfers in the course of business, being able to accurately forecast movements of currency exchange rates can result in substantial improvement in the overall profitability of the firm. However, the literature shows that predicting the exchange rate movements are largely unforecastable due to their high volatility and noise and still are a problematic task. Many researches in time series forecasting have argued that predictive performance improves in combined models, especially when the models in the ensemble are quite different. Hybrid techniques that decompose a time series into its linear and nonlinear components are one of the most popular hybrid models categories, which have been shown to be successful for single models. However, they have yielded mixed results in some situations in comparison with components models used separately; and hence, it is not wise to apply them blindly to any type of data. In this paper, an enhanced version of hybrid neural based models is proposed, incorporating the autoregressive integrated moving average (ARIMA) and artificial neural networks (ANNs) for financial time series forecasting. In proposed model, in contrast to the traditional hybrid ARIMA/ANNs, it can be guaranteed that the performance of the proposed model will not be worse than either of the components models used separately. In additional, empirical results in exchange rate forecasting indicate that the proposed model can be an effective way to improve forecasting accuracy achieved by traditional hybrid ARIMA/ANNs models. Therefore, it can be used as an appropriate alternative model for forecasting in exchange rate markets, especially when higher forecasting accuracy is needed. Khashei, M., “Soft Intelligent Decision Making”, Ph.D. Thesis, Department of Industrial and Systems Engineering, Isfahan University of Technology (IUT), 2005. Khashei, M., Bijari, M., “Exchange rate forecasting better with hybrid artificial neural networks models”, Journal of Mathematic Computing Sciences, Vol. 1, pp. 103– 125, 2011. Box, P., Jenkins, G., “Time Series Analysis: Forecasting and Control”, Holden-day Inc, San Francisco, CA, 1976. Khashei, M., Bijari, M., “An artificial neural network (p, d, q) model for time series forecasting”, Expert Systems with Applications, vol. 37, pp. 479– 489, 2010. Preminger, A. and Franck, R., “Forecasting exchange rates: A robust regression approach”, International Journal of Forecasting, vol. 23, pp.71– 84, 2007. Tang, B., “Real exchange rate and economic growth in China: A cointegrated VAR approach”, China Economic Review, Vol. 34, pp. 293-310, 2015. Grossmann, A., Love, I., Orlov, A., “The dynamics of exchange rate volatility: A panel VAR approach”, Journal of International Financial Markets, Institutions and Money, Vol. 33, pp. 1-27, 2014. Jaskela, J., Jennings, D., “Monetary policy and the exchange rate: Evaluation of VAR models”, journal of International Money and Finance, Vol. 30, pp. 1358-1374, 2011. Carriero, A., Kapetanios, G., Marcellino, M., “Forecasting exchange rates with a large Bayesian VAR”, International Journal of Forecasting, Vol. 25, pp. 400-417, 2009. Aloui, R., Aïssa, M., “Relationship between oil, stock prices and exchange rates: A vine copula based GARCH method”, The North American Journal of Economics and Finance, Vol.37, pp. 458-471, 2016. Maria, G., Menla, C., Spagnolo, N., “Exchange rate uncertainty and international portfolio flows: A multivariate GARCH-in-mean approach”, journal of International Money and Finance, Vol. 54, pp. 70-92, 2015. Wu, C., Chung, H., Chang, Y., “The economic value of co-movement between oil price and exchange rate using copula-based GARCH models, Energy Economics, Vol. 34, pp. 270-282, 2012. Quaicoe, M., Twenefour, F., Baah, E., Nortey, E., “Modeling variations in the cedi/dollar exchange rate in Ghana: an autoregressive conditional heteroscedastic (ARCH) models”, Springer Plus , Vol. 4, pp. 329- 347, 2015. Pilbeam., K., Langeland, K., “Forecasting exchange rate volatility: GARCH models versus implied volatility forecasts”, Int. Econ. Econ Policy, Vol. 12, pp.127–142, 2015. Enders, W., Pascalau, R., “Pretesting for multi-step-ahead exchange rate forecasts with STAR models”, International Journal of Forecasting, Vol. 31, pp. 473-487, 2015. Boutahar, M., Mootamri, I., Feissolle, P., “A fractionally integrated exponential STAR model applied to the US real effective exchange rate”, Economic Modelling, Vol. 26, pp. 335-341, 2009. Baharumshah, A., Liew, V., “Forecasting Performance of Exponential Smooth Transition Autoregressive Exchange Rate Models”, Open economies review, Vol. 17, pp. 235–251, 2006. Zhang, G. P., “A neural network ensemble method with jittered training data for time series forecasting”, Information Sciences, vol. 177, pp.5329–5346, 2007. Malki, H., Karayiannis, N. and Balasubramanian, M., “Short-term electric power load forecasting using feedforward neural networks”, Expert Systems, Vol. 21 (3), pp. 157-167, 2004. Zhang, G., B. E. Patuwo and M. Y. Hu, “Forecasting with artificial neural networks:" The state of the art”, International Journal of Forecasting, Vol. 14, pp. 35–62, 1998. Yao, J., and C.L. Tan, “A case study on using neural networks to perform technical forecasting of forex”, Neurocomputing, Vol. 34, pp. 79- 98, 2000. Gencay, R., “Linear, non-linear and essential foreign exchange rate prediction with simple technical trading rules”, Journal of International Economics, Vol. 47, pp. 91– 107, 1999. Weigend, A. S., D. E. Rumelhart and B. A. Huberman, “Generalization by weight-elimination with application to forecasting”, Advances in Neural Information Processing Systems, Vol. 3, pp. 875-882, 1991. Kuan, C. M. and T. Liu, “Forecasting exchange rates using feedforward and recurrent neural networks”, Journal of Applied Econometrics, Vol. 10, pp. 347-364, 1995. Hann, T. H. and E. Steurer, “Much ado about nothing? Exchange rate forecasting: neural networks vs. linear models using monthly and weekly data”, Neurocomputing, Vol. 10, pp. 323-339, 1996. Santos, A., N. da Costa Jr and L. Coelho, “Computational intelligence approaches and linear models in case studies of forecasting exchange rates”, Expert Systems with Applications, Vol. 33, pp. 816–823, 2007. Galeshchuk, S., “Neural networks performance in exchange rate prediction”, Neurocomputing, Vol. 172, pp. 446-452, 2016. Rehman, M., Khan, G., Mahmud, S., “Foreign Currency Exchange Rates Prediction Using CGP and Recurrent Neural Network”, IERI Procedia, Vol. 10, pp. 239-244, 2014. Shen, F., Chao, J., Zhao, J., “Forecasting exchange rate using deep belief networks and conjugate gradient method”, Neurocomputing, Vol. 167, pp. 243-253, 2015. Yuan, Y., “Forecasting the movement direction of exchange rate with polynomial smooth support vector machine”, Mathematical and Computer Modelling, Vol. 57, pp. 932-944, 2013. Majhi, B., Rout, M., Majhi, R., Panda, G., Fleming, P. “New robust forecasting models for exchange rates prediction”, Expert Systems with Applications, Vol. 39, pp. 12658-12670, 2012. Sermpinis, G., Dunis, C., Laws, J., Stasinakis, C., “Forecasting and trading the EUR/USD exchange rate with stochastic Neural Network combination and time-varying leverage”, Decision Support Systems, Vol. 54, pp. 316-329, 2012. Lahmiri, S., “Modeling and predicting historical volatility in exchange rate markets”, Physica A, Vol. 471, pp. 387–395, 2017. Huang, S., Chuang, P., Wu, C., Lai, H., “Chaos-based support vector regressions for exchange rate forecasting”, Expert Systems with Applications, Vol. 37, pp. 8590-8598, 2010. Yu, L., Lai, K., Wang, S., “Multistage RBF neural network ensemble learning for exchange rates forecasting”, Neurocomputing, Vol. 71, pp. 3295-3302, 2008. Dhamija, A., Bhalla, V., “Exchange rate forecasting: comparison of various architectures of neural networks”, Neural Computing & Application, Vol. 20, pp.355–363, 2011. Taskaya, T. and M. C. Casey, “A comparative study of autoregressive neural network hybrids”, Neural Networks, Vol. 18, pp. 781–789, 2005. Aydin, A., Cavdar, S., “Comparison of Prediction Performances of Artificial Neural Network (ANN) and Vector Autoregressive (VAR) Models by Using the Macroeconomic Variables of Gold Prices, Borsa Istanbul (BIST) 100 Index and US Dollar-Turkish Lira (USD/TRY) Exchange Rates”, Procedia Economics and Finance, Vol. 30, pp. 3-14, 2015. Khashei, M., Bijari, M., “A novel hybridization of artificial neural networks and ARIMA models for time series forecasting”, Applied Soft Computing, Vol. 11, pp. 2664– 2675, 2011. Zhang, G.P., “Time series forecasting using a hybrid ARIMA and neural network model”, Neurocomputing, Vol. 50, pp. 159–175, 2003. Terui, N. and H. van Dijk, “Combined forecasts from linear and nonlinear time series models”, International Journal of Forecasting, Vol. 18, pp. 421–438, 2002. Hibon, M. and T. Evgeniou, “To combine or not to combine: selecting among forecasts and their combinations”, International Journal of Forecasting, Vol. 21, pp. 15–24, 2005. Huang, S., and Wu, T., “Combining wavelet-based feature extractions with relevance vector machines for stock index forecasting”, Expert Systems, Vol. 25 (2), pp. 133-149, 2008. Tsaih, R., Y. Hsu and C.C. Lai, “Forecasting S&P 500 stock index futures with a hybrid AI system”, Decision Support Systems, Vol. 23, pp. 161–174, 1998. Medeiros, M.C. and A. Veiga, “A hybrid linear-neural model for time series forecasting”, IEEE Transaction on Neural Networks, Vol. 11 (6), pp. 1402–1412, 2000. Pai, P.F. and C.S. Lin, “A hybrid ARIMA and support vector machines model in stock price forecasting”, Omega, Vol. 33, pp. 497–505, 2005. Chen, K.Y. and C.H. Wang, “A hybrid SARIMA and support vector machines in forecasting the production values of the machinery industry in Taiwan”, Expert Systems with Applications, Vol. 32, pp. 254–264, 2007. Zhou, Z.J. and C.H. Hu, “An effective hybrid approach based on grey and ARMA for forecasting gyro drift”, Chaos, Solitons and Fractals, Vol. 35, pp. 525–529, 2008. Armano, G. M. Marchesi and A. Murru, “A hybrid genetic-neural architecture for stock indexes forecasting”, Information Sciences, Vol. 170, pp. 3- 33, 2005. Khashei, M., Bijari, M., Raissi, GH A., “Improvement of Auto-Regressive Integrated Moving Average Models Using Fuzzy Logic and Artificial Neural Networks (ANNs)”, Neurocomputing, Vol. 72, pp. 956– 967, 2009. Yu, L., S. Wang and K.K. Lai, “A novel nonlinear ensemble forecasting model incorporating GLAR and ANN for foreign exchange rates”, Computers and Operations Research, Vol. 32, pp. 2523–2541, 2005. Kim, H. and K. Shin, “A hybrid approach based on neural networks and genetic algorithms for detecting temporal patterns in stock markets”, Applied Soft Computing, Vol. 7, pp. 569–576, 2007. Tseng, F.M., H.C. Yu and G.H. Tzeng, “Combining neural network model with seasonal time series ARIMA model”, Technological Forecasting & Social Change, Vol. 69, pp. 71–87, 2002. Khashei, M., Hejazi, S. R., Bijari, M., “A new hybrid artificial neural networks and fuzzy regression model for time series forecasting”, Fuzzy Sets and Systems, Vol. 159, pp. 769 – 786, 2008. Sermpinis, G., Stasinakis, C., Theofilatos, K., Karathanasopoulos, A., “Modeling, forecasting and trading the EUR exchange rates with hybrid rolling genetic algorithms—Support vector regression forecast combinations”, European Journal of Operational Research, Vol. 247, pp. 831-846, 2015. Ni, H., Yin, H., “Exchange rate prediction using hybrid neural networks and trading indicators”, Neurocomputing, Vol. 72, pp. 2815-2823, 2009. Ince, H., Trafalis, T., “A hybrid model for exchange rate prediction”, Decision Support Systems, Vol. 42, pp. 1054-1062, 2006. Chang, J., Tsai, P., Chen, J., Hsiao, C., “The Comparison between IABC with EGARCH in Foreign Exchange Rate Forecasting”, Intelligent Data Analysis and Its Applications, Vol. 2, pp. 127-136, 2014. Hajizadeh, E., Mahootchi, M., Esfahanipour, A., Massahi, M., “A new NN-PSO hybrid model for forecasting Euro/Dollar exchange rate volatility”, Natural Computing Applications, DOI 10.1007/s00521-015-2032-7, 2014. Gharleghi, B., Shaari, A., Shafighi, N., “Predicting exchange rates using a novel “cointegration based neuro-fuzzy system”, International Economics, Vol. 137, pp. 88-103, 2014. Anastasakis, L., Mort, N., “Exchange rate forecasting using a combined parametric and nonparametric self-organizing modelling approach”, Expert Systems with Applications, Vol. 36, pp. 12001-12011, 2009. Gradojevic, N., “Non-linear, hybrid exchange rate modeling and trading profitability in the foreign exchange market”, Journal of Economic Dynamics and Control, Vol. 31, pp. 557-574, 2007. Ediger, V. and S. Akar, “ARIMA forecasting of primary energy demand by fuel in Turkey”, Energy Policy, Vol. 35, pp. 1701–1708, 2007. Chakradhara, P. and V. Narasimhan, “Forecasting exchange rate better with artificial neural network”, Journal of Policy Modeling, Vol. 29, pp. 227–236, 2007. Meese, R.A. and K. Rogoff, “Empirical exchange rate models of the seventies: do they fit out of samples?”, Journal of International Economics, Vol. 14, pp. 3–24, 1983. ISNAD Khashei, Mehdi , Torbat, Sheida , Haji Rahimi, Zahra . "An Enhanced Neural-based Bi-Component Hybrid Model for Foreign Exchange Rate Forecasting". 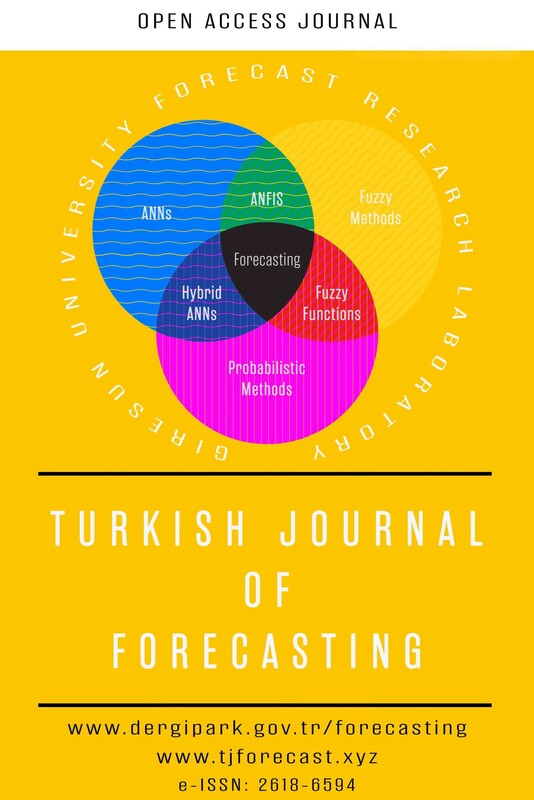 Turkish Journal of Forecasting 01 / 1 (August 2017): 16-29.